Steaks are best on the grill, no doubt about it. You can of course also prepare them in a skillet, which is absolutely fine too. This recipe assumes a grill. In our household, Tom is the "head griller" and does a consistently wonderful job grilling our steaks and hamburgers to perfection! 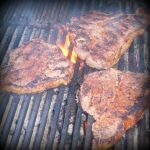 All we do is sprinkle a tiny bit of mesquite seasoning on them, and cook over our own mesquite wood. a pinch mesquite or steak seasoning optional. Some use a little sea salt instead. 4 JX Ranch steaks T-Bone, Rib-Eye, Sirloin, Tenderloin, NY Strip etc. Get the fire on your grill plenty hot. Sear the steaks quickly, turning them over once. Lower temperature on grill, put down lid on grill so steaks cook slowly on lower heat. Check for doneness. We prefer medium-rare, no more. Keep in mind the meat will continue to cook inside for a few minutes after you remove them from the grill. You can always put them back on for a minute or two if not done enough to your liking. Serve immediately, with baked potatoes and a nice salad! Mimi's Tip: It's best if you don't thaw the steaks (or any meat) in the microwave as it tends to toughen meat. Best is in the fridge, and set out on the counter for an hour or so, so the meat isn't ice cold when placed on the grill.